Friday morning and I stir to the light working its way through the blinds, the air is cool as I roll back under the covers. The light is bright however as I inch up the blinds to see a beautiful bluebird sky with not a cloud to be seen. Today is going to be a beautiful day. I glance at the clock and remember the Park Rangers suggestion to be at the station by 9:00 am if I want any chance at an electrical outlet camping site. I drove through the main campground yesterday and as impressed as I was with the trees, and blacktop drive through sites, the sites are almost on top of each other. I think I'll just stay here at Bryce View Campground where the sites are a little further apart. I'll still have to go by the station, but I shouldn't have to rush. I eat breakfast under the Juniper tree on the provided picnic table, while reviewing maps of the area. I've settled on the Grand Parade Trail, a short 1.5 mile loop, easy trail here in the park. I figured I could do that in the cool of the day then drive the 30 miles and hike to the summit of Canaan Peak located between Cannonville and Escalante, UT. Canaan Peak sits at an elevation of 9,340 and is primarily a hike through tall (shaded) pine trees. With a plan for the day I cleaned up the dishes and drove to the Ranger Station about 9:15 am. "I only have 2 sites left" the park ranger said and I stood there in (almost) shock surprise. I really need to work on the "planning" element of this camping side of things. "Site #1 and Site #55 in the Bryce View Campground". "I'll take Site #55 please", I said, grateful to have a place to sleep tonight and very little distance to move the trailer. "You can move whenever the site if vacant" said the ranger as I signed the receipt and collected my new window and stump reservation notices. Leaving the station I continue driving down the Kodachrome State Park Road to the Panorama and Grand Parade Trailhead. It is about 9:40 am on a Friday morning and there is only 1 additional car in the parking lot plus 2 motor homes. Panorama is the longer and more popular trail as I put some water in my pack and pick up my hiking pole. Grand Parade Trail "winds its way across the floor of Kodachrome Basin" and "two box canyons can be accessed and explored on foot from the main trail." The trail begins a slow rise among the sage, wild grass, and Juniper trees as it drops into and out of the several washes flowing from the "box canyons" ahead of me. It is again very evident that this area of Utah saw significant rain fall yesterday, as I step off eroded banks and washed out trails. The wide trail is easy to pick up again on the other side, but it is going to take some manpower to restore the trails to their former condition. Sedimentary pipes are again the main area of focus as several spires rise above the softer red rock. I soon arrive at the first Box Canyon on the trail. So far, I have only been able to make out a few foot prints on the trail, but I haven't seen or heard anyone yet today. The trail hikes up and through the wash toward the box canyon and I marvel at the surrounding beauty in the morning sun. A spire, resting on the horizontal ridge line, is catch the morning sun and is breathtaking. I try to capture (unsuccessfully) this amazing sight. I don't think it is a pipe, due to its shine, but looks to be a single pinnacle left standing as the rest of the mountain eroded. I move close to several of the slot canyons that roll off the face of this stunning butte, but I don't enter. With the amount of water that flowed through this area yesterday, things are bound to be unstable for awhile. Standstone can be tough, but when wet becomes easy to break. I move out of the box canyon and back onto the main trail. The trail continues to loop along the base of the towering cliffs and as the sun warms up the morning air, I'm glad the majority of the trail is still in the shade. Shaded trail view back toward the several Sedimentary Pipes near the trailhead. Soon I hear voices and notice a group of 3 ahead of me. The trail passes another box canyon and I decide not to enter due to my desire to get camp moved and make my way toward Canaan Peak. The final highlight of the Grand Parade Trail is a singular sedimentary pipe that is (almost) completely devoid of any surrounding (softer) red rock. The pipe stand alone as the trail loops around to meet it. 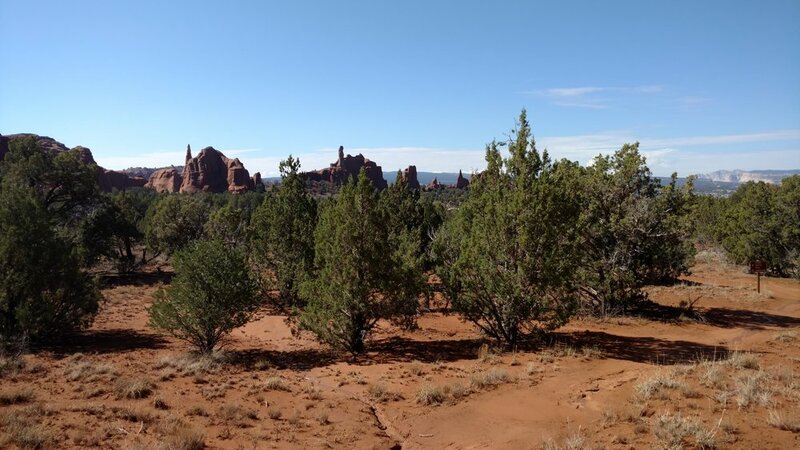 The trail then wanders among the Juniper trees and along the wash back toward the trailhead. I notice a side trail that leads to the campground which might explain the lack of cars in the parking lot, but it certainly doesn't explain the lack of hikers on this beautiful trail in the cool morning air. Trail view heading back to trailhead.